The materials used in B&G Sheds buildings have warranties that flow through from their suppliers. For our customer's peace of mind, all buildings use genuine Australian made products from Bluescope Steel and roller doors are from B&D Doors. BlueScope Steel offers a warranty of up to 15 years* from the date of installation against corrosion to perforation by weathering in the natural elements, when used as roofing and walling for sheds and domestic garage applications located greater than one kilometre from a marine environment only. It applies to the following products when used in shed and large domestic garage applications (covering an area of not less than 18 square metres). Their warranty is attached below. B&D Doors offer warranty on all rolling door and panel door products. Their warranty is attached below. All buildings supplied by B&G Sheds are engineer designed and come with Plans and a Compliance Certificate which warrants the design for 6.5 yrs. That warranty is backed by the engineer's professional indemnity insurance. Our installation crews warranty their work for a period of 12 months after installation. 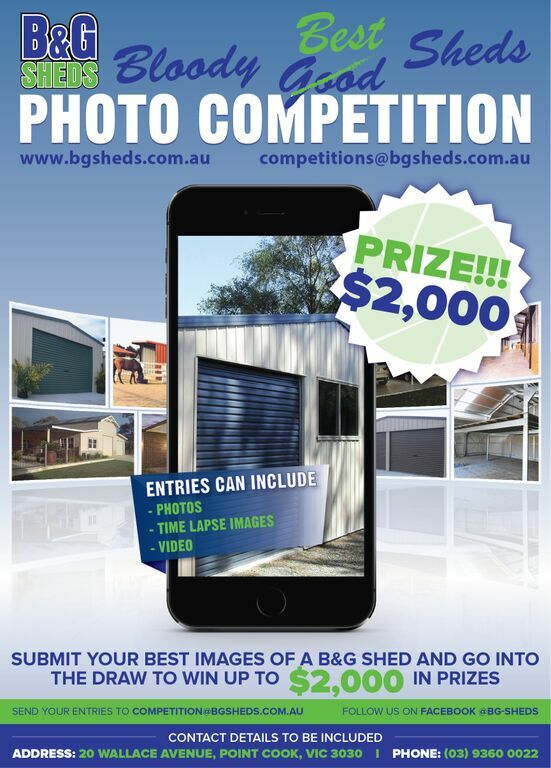 Any warranty claims should be reported directly to B&G Sheds. Note : Warranty terms and conditions apply. Warranties are not available for all products and applications. The duration and terms and conditions of available warranties vary according to product use and application. This warranty is only applicable to a professionally designed and constructed enclosed light industrial structure, erected on a concrete slab footing, utilising COLORBOND steel roofing with base metal thickness of 0.42 or greater and walling with base metal thickness of 0.35mm or greater and covering an area of not less than 36 sqm. The product is installed in accordance with the manufacturers published fixing recommendations, these being in according with AS/NZS current at the time of installation. Installation is greater than 1 km from marine or industrial environments. The product has an official BlueScope Steel COLORBOND steel brand. All flashings and components fixed to the roof must be either manufactured from COLORBOND steel or ZINCALUME steel, aluminium, zinc or other BlueScope Steel approved material in accordance the BlueScope Steel recommendations. The BlueScope Seel pain finish as supplied must not be scratched, abraded or damaged in any way, or coated with an incompatible material. All fasteners used for fixing COLORBOND steel are to be in accordance with BlueScope Steel recommendations. Sheltered areas or areas unwashed by rain exposure must be washed down on a regular 6 monthly basis in accordance with BlueScope Steel recommendations. Corrosion arising in unwashed areas will not be covered by the warranty. Wall sheeting must not be used as concrete formwork or be immersed during construction or immersed during general exposure. Mechanical, chemical, corrosion or other damage sustained during transport handling, storage, erection or subsequent to erection. Attack from chemical agents, fumes, liquids or solids other than direct rain falling onto the product under warranty. Contact with concrete, mortar, bitumen, soils, ashes, fertilizers or other moisture retaining substances. Immersion as a result of flood or sub standard site drainage. Failure to provide a free drip edge to all sheeting. Areas in metallic contact with lead or copper or subject to the run-off from lead or copper flashing and pipes. Deterioration of the sheet caused by contact with green, wet or treated timbers. Installations subject to unusually corrosive environments at any time in the future. Replacement product will be supplied at a discount, which bears the same ratio to the then current price as that part of the warranty period not achieved bears to the full warranty period. The cost of replacing the product. Injury to persons, or damage to property or consequential losses arising from the use of the product. BlueScope Steel extends this warranty solely to the manufacturer. BlueScope Steel reserves the right to inspect a building prior to issuing of the warranty. This warranty is given in lieu of all other considerations or warranties expressed or implied except to the extent that any statute applicable to this contract prevents the exclusion restrictions or modification of such conditions or warranties. Please visit the BlueScope Steel website to review all terms and conditions of this warranty. COLORBOND® steel sheeting available in 20 modern colours and featuring superior oven-baked finish that resists chipping, peeling and cracking. B&D Natural Timber Doors – in normal residential use, are covered by a 1 year warranty on the structural integrity of the door and associated labour. B&D Industrial/Commercial Doors – in normal use, are covered by a 1 year warranty for all components and associated labour; and in each case the warranty applies from the later of the date of purchase, delivery or installation by B&D or an approved distributor (as applicable).